Come join us THIS Thursday, 6-8pm, for our annual Wade Thomas MAKER NIGHT!! 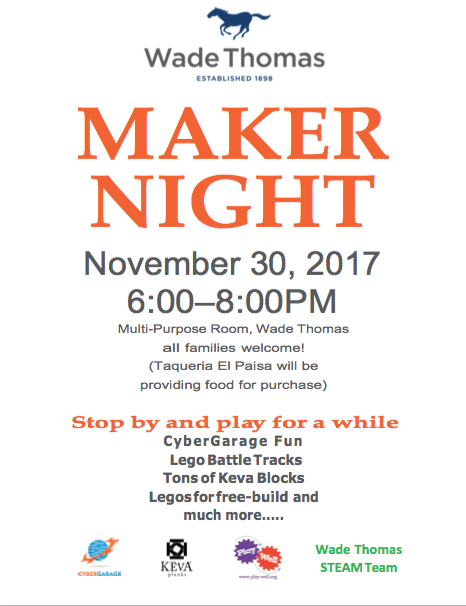 Cyber Garage, Play-Well TEKnologies and WT’s STEAM Team are bringing a fun evening of Maker Activities for all Wade Thomas families, all ages. *Play and take care of dinner at the same time! A taco truck will be on site for you to purchase dinner!